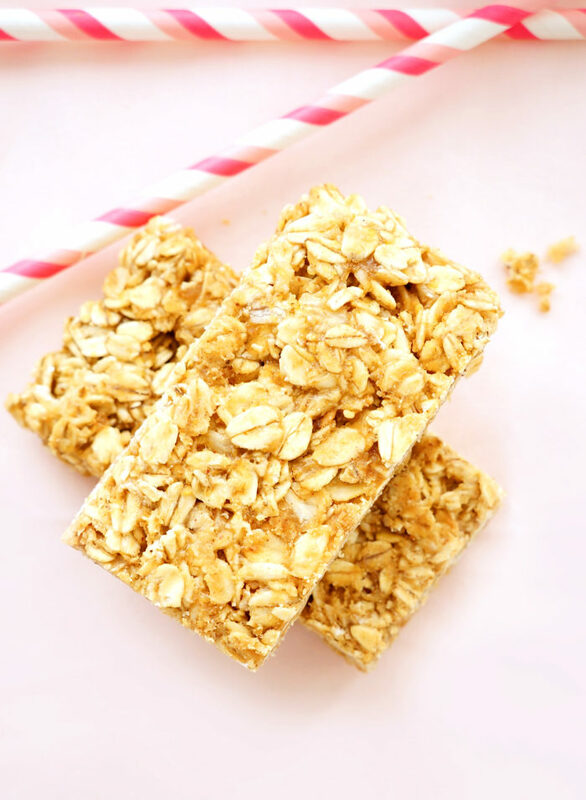 Are you ever just looking for a pre-made convenient snack to throw into your lunch bag or take with you on the go that isn’t full of a bunch of sugar and other highly processed ingredients? I know that I’m often on a mission to find these types of snacks. But they’re tough to find! That is why I LOVE these homemade peanut butter protein bars. They contain only four simple ingredients! And one of them just happens to be peanut butter. One of my favourite foods EVER. You might have noticed my love for PB if you checked out my recipes for my Chocolate Banana Overnight Oats or my Skinny Chocolate Peanut Butter Cupcakes. You just can’t go wrong with PB. Now if I have the choice, I always prefer making something over buying the packaged version so that I can control the ingredients that are going into the meal or snack. That being said, with a busy schedule and limited time, I’d rather not slave over the recipe for hours and hours…. ESPECIALLY if I’m going to be making it on a regular basis. 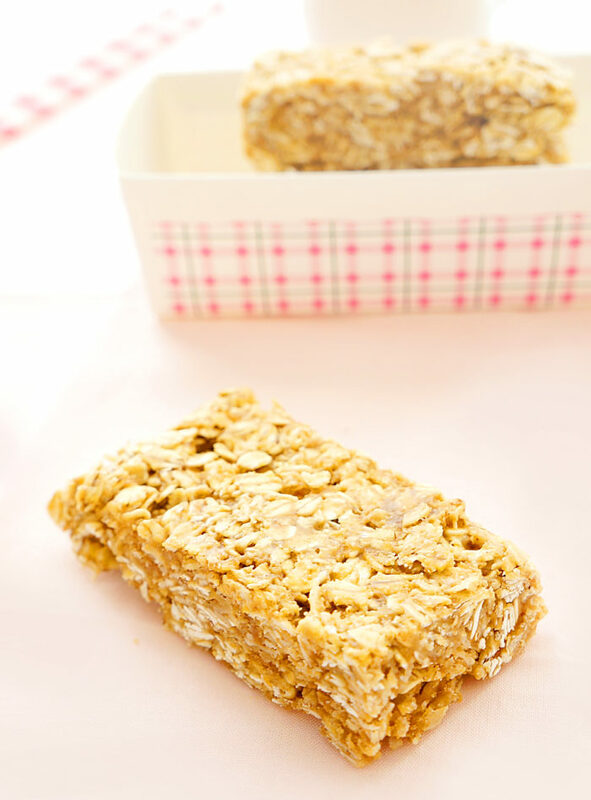 With these bars, you can make them in less than 10 minutes, and they’ll last the entire week! Usually, I like to whip up a batch of these on the weekend and store them in the freezer in individual snack bags so that they’re all ready to just grab and go during the week. This is one of my strategies for having ready-made healthy snacks so that I’m less likely to grab for those not-so-healthy convenience foods. 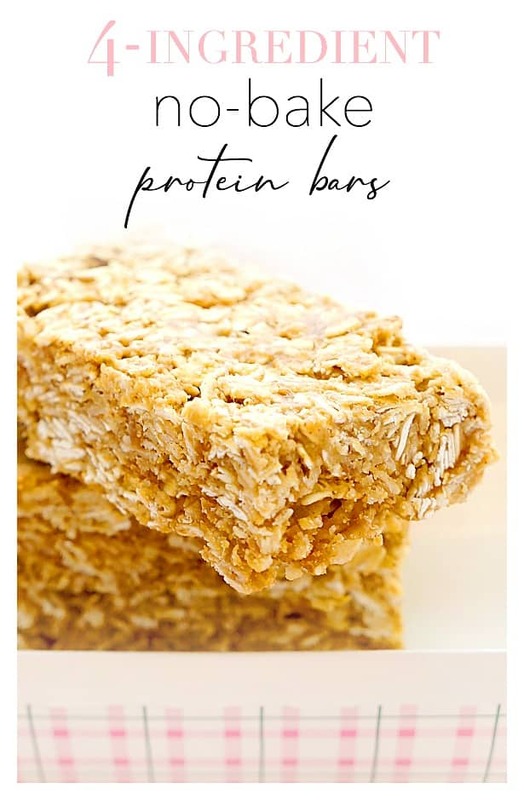 Plus, they’re a great source of fibre with 4 grams per bar, and they’re low in sugar since the only sweetness is coming from the protein powder! I always recommend looking for a bar with at least 4 grams of fibre and less than 8 grams of sugar, so these totally meet that criteria. 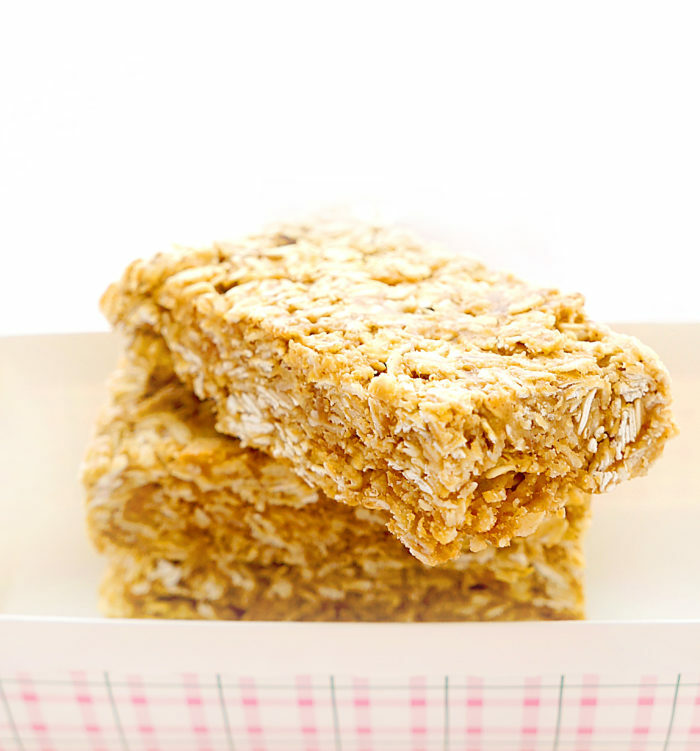 There aren’t too many bars with that kind of nutritional breakdown…believe me! 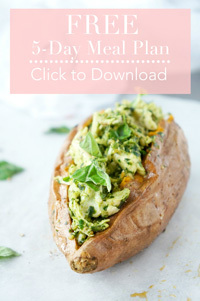 They also have the perfect balance of healthy fats, complex carbohydrates and contain 14 grams of protein! Although you can use any type of vanilla protein powder, I’ve had really good results with the Sunwarrior Vanilla Protein Powder. In the past, I would use whey protein powder but I found it upset my stomach, so I switched over to this vegan protein powder and I haven’t turned back. 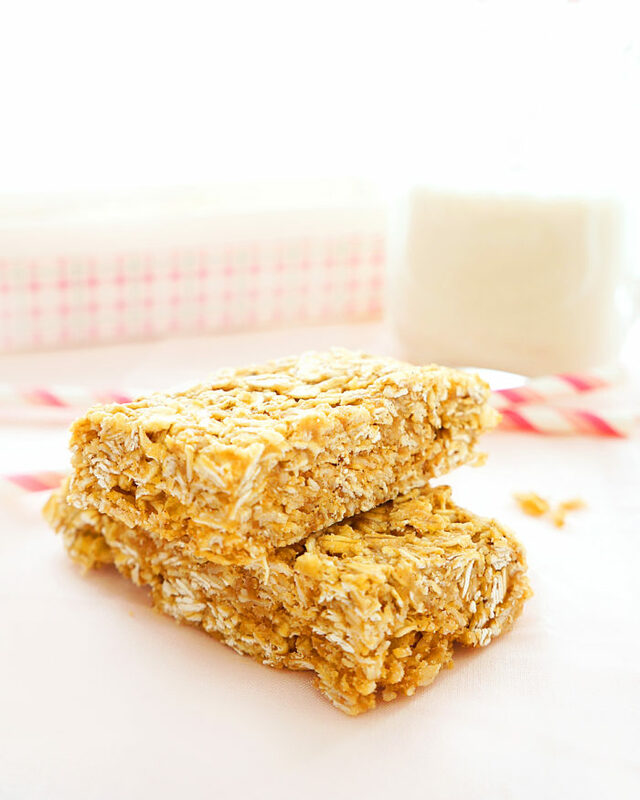 I love it’s clean ingredient list and I find it works well for bake and no-bake recipes as well. I use it for basically everything! 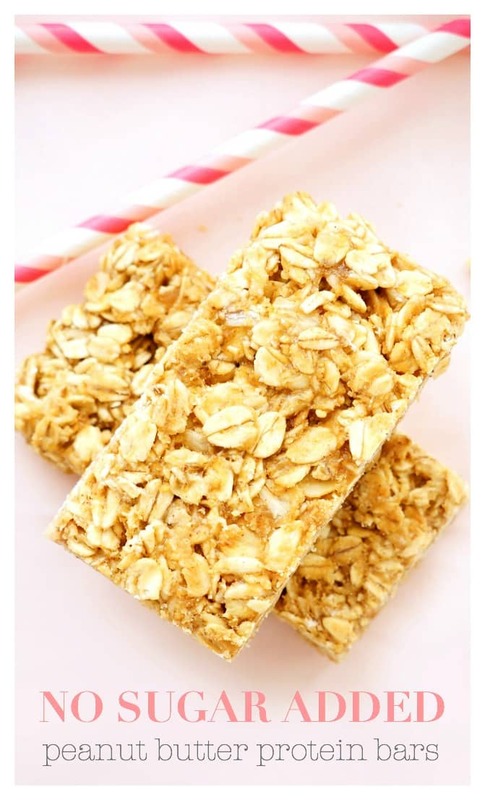 So I recommend clearing the cupboard of those packaged granola bars and try making your own! It’s SO easy and so much better for you in the long run! In a large bowl, mix together the oats and vanilla protein powder. Next, add the peanut butter and almond milk and stir until well combined and slightly sticky so that the mixture binds together. Line a 9-inch square baking pan with parchment paper and press the mixture into the pan with a spatula until equally distributed. Place the pan in the freezer for 30 minutes. Remove from freezer and cut the mixture into 8 equal bars. You may need to let it thaw out for a few minutes before you can cut through the bars. Place each bar in a little Ziploc bag or saran wrap and store in freezer.